(Hong Kong, 8 Aug 2018) Founded in 1948, Hip Shing Hong (Holdings) Company Limited (“Hip Shing Hong” or “The Group”) has been committed to upholding its four core values of “Prudence, Innovation, Excellence and Caring”. Evolved from a local trader of cinnamon and sesame into a renowned property developer, Hip Shing Hong has an extensive portfolio of prime real estate developments, ranging from Grade A private offices, upscale residential complexes, smart industrial buildings to retail shops and boutique hotels. This year marks its 70th Anniversary. 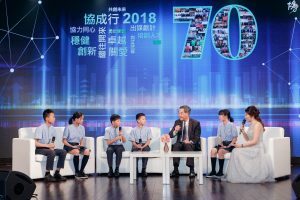 To commemorate its remarkable milestone, the Group held the “Hip Shing Hong 70th Anniversary Celebration Dinner” on 8th August at Grand Hyatt Hong Kong. The celebration dinner was graced by The Hon. Mrs. Carrie LAM CHENG Yuet-ngor, The Hon. C Y LEUNG, Mr. WANG Zhi-min, The Director of The Liaison Office of the Central People’s Government in HKSAR; The Hon. Matthew CHEUNG Kin-chun, The Hon. Paul CHAN Mo-po, The Hon. Andrew LEUNG Kwan-yuen, The Hon. Nicholas W YANG, The Hon. Mr. TAM Yiu-chung, Mr. Ian FOK Chun-wan, Mr. Ho Iat Seng, President of the Legislative Assembly of Macao SAR; Dr. LUI Che-woo, Dr. LEE Ka-kit, Peter, Dr. CHENG Chi-kong, Adrian, Dr. Norman LEUNG Nai-pang and many other guests. The celebration dinner featured many HK classic songs and showcased memorable photos of Hip Shing Hong’s and Hong Kong’s past. The highlight of the night was a chit-chat session between The Hon. C Y LEUNG and the He’nan-born quintuplets, long-time beneficiaries of Fong’s Family Foundation sponsorships. Since 1896, around 20 birth cases of quintuplets have been documented globally. There is another source pointing out that around 17 cases were recorded in China from 1996 to 2011 and only 6 cases were completely survived. When they were 18 months old, the He’nan quintuplets’ deprivation caught Dr. Fong’s attention, who then took the initiative to contact the Chinese government for the sponsorship arrangement. Since then, the quintuplets have been able to grow healthily and live happily. In the chit-chat session, the audience was touched by the dialogue, and The Hon. C Y Leung offered his blessings to the teenagers, hoping that they will give back to society and the country when they grow up. The celebration was concluded with a picturesque violin and dance performance, bringing its guests a night of enormous pleasure. FONG Yun-wah, Henry, Chairman of Hip Shing Hong (Holdings) Company Limited (middle); The Hon. Mrs. Carrie LAM CHENG Yuet-ngor (fifth from the left); The Hon. C Y LEUNG (fifth from the right); Mr. WANG Zhi-min, The Director of The Liaison Office of the Central People’s Government in HKSAR (fourth from the left); Mr. FONG Fu-wah, Deputy Chairman of Hip Shing Hong (Holdings) Company Limited (fourth from the right); Mr. FONG Man-hung, David, Managing Director of Hip Shing Hong (Holdings) Company Limited (third from the right); Dr. LUI Che-woo (third from the left); Dr. LEE Ka-kit, Peter (second from the left); Dr. CHENG Chi-kong, Adrian (second from the right); Mr. Ian FOK Chun-wan (first from the left) and Dr. Norman LEUNG Nai-pang (first from the right) officiated at the kick-off ceremony. In the chit-chat session, The Hon. 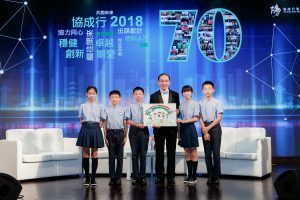 C Y Leung offered his blessings to the He’nan-born quintuplets, long-time beneficiaries of Fong’s Family Foundation sponsorships, hoping that they will give back to society and the country when they grow up. The He’nan-born quintuplets presented a drawing to Mr. FONG Man-hung, David, Manager Director of Hip Shing Hong (Holdings) Company Limited, to express their sincere gratitude to the Fong’s Family for their unwavering support. 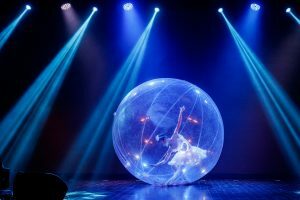 The celebration was concluded with a picturesque crystal ball dance performance. Founded in 1948, Hip Shing Hong (Holdings) Company Limited (“Hip Shing Hong”) is an astute property developer based in Hong Kong. With 70 years of extensive experience in the industry, Hip Shing Hong has actively developed, built and acquired a well-diversified portfolio of properties, which consists of full serviced office spaces, upscale residential complexes, smart industrial buildings, retail stores, hotels and serviced apartments, and urban revitalization projects. Hip Shing Hong is fully rooted in corporate social responsibilities since the early 1960’s and has donated over 500 charitable projects. In recent years, Hip Shing Hong has earned numerous accolades, including “Caring Company Logo” for 14 consecutive years, “CarbonCare Champion Label”, “Hong Kong Outstanding Corporate Citizenship Award”, “Distinguished Family-Friendly Employer”, “WGO Green Office Label” and “UNMDGs Better World Company Label”. Hotel Madera Hong Kong, an affiliate of Hip Shing Hong, captured Silver Award in “Hotels and Recreational Clubs” sector at “Hong Kong Awards for Environmental Excellence” etc. Hip Shing Hong has also achieved recognitions in other areas, such as “The 12th China Golden Awards for Excellence in Public Relations Silver Award”, “HKMA Quality Award”, “Best Office Architecture Award”, etc. For details, please visit www.hshd.com.hk.